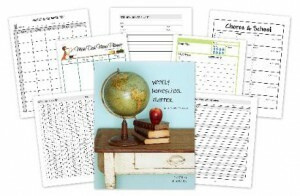 At the beginning of the 2012-2013 school year I shared about my excitement for the Weekly Homeschool Planner that would hopefully make our first homeschooling year go smoothly. So did it? The notes on the editable PDF planner triggered my brain on all the early field trips we took throughout the year. Now that I have completed an entire year and can see the true value of this planner I’m SO happy I bought it. I personally am taking this ‘summer break’ to fully prepare for the next school year. I’m also going to ditch the unschooling vibe and go back to a more structured approach like we did in the beginning part of the year. Having an Autistic child I know that this would make his life (and mine) a lot less stressful. I wish someone had smacked me for waiting so long to buy it in the first place and should have never stopped using it! Plus being a editable PDF (meaning you can use this planner year after year after year after year) no one has to know that mommy has horrible handwriting and should be doing the handwriting program with her kids! That right there takes this planner into triple time bonus.